BHU Recruitment 2019 - Apply Online for 1305 Non-Teaching & School Teaching Posts in BHU, Uttar Pradesh. Online Applications are invited by Banaras Hindu University (BHU) from 01 Feb 2019 to 16 Feb 2019 till 05:00 PM (Extended till 12 Mar 2019 till 05:00 PM) for 1305 vacancies. One post on deputation basis from any organized services of the Govt. of India. The Finance Officer shall be a whole time salaried Officer in the Scale of Pay of Rs. 37400 – 67000 plus GP of Rs. 10000. The applicant shall be holding an analogous post in the same scale of pay in his parent organization. The candidate shall preferably have at least 5 years of service left before superannuation. (a) Second Class Master’s Degree with not less than 50% marks. (i) Master Degree from a recognized University with at least 50% marks in aggregate. (i) Master Degree/Acharya in any branch of Sanskrit from a recognized University with at least 50% marks in aggregate. MBBS recognized by MCI, MD/MS recognized by MCI in any clinical subject with 10 years of administrative experience in a teaching hospital having a minimum of 500 beds. Master Degree in Nursing with a minimum of 3 years Teaching/Administrative/Hospital Experience OR Diploma in Nursing or any equivalent qualification with 8 years Teaching/ Administrative/ Hospital Experience OR B. Sc. Nursing (Basic or Post Basic) with 5 years Teaching/ Administrative/ Hospital Experience. M.Sc. in Nursing with a minimum of 06 years administrative experience in nursing in a hospital of 500 beds or above OR B.Sc. Nursing (Basic or Post Basic) with 8 years administrative experience of nursing in a hospital of 500 beds or above. B.E./B.Tech in Computer Science & Engg./Electronics Engg./M.Sc. Computer Science/MCA, with 05 years of programming experience in C/C++/Java etc. OR Master Degree in Engg./Technology in Computer Science & Engg/Electronics Engg. with 03 years’ experience in programming. (1)M.Sc. in Physics with Spl. in Electronics or M.Sc. in Electronics or B.E./B.Tech. Electronics Engg./ Electronics Instrumentation. (i) Degree or Diploma in Electrical/Mechanical Engineering with at least 50%. a) Second Class Master’s Degree in relevant subject with not less than 50% marks from a recognized University. a) Second Class Bachelor’s Degree with not less than 50% marks in aggregate including elective subjects and language with B.Ed. or its equivalent Degree duly recognized by NCTE from a recognized University. Degree in Music from a recognized University. (a) Senior Secondary (or its equivalent) with at least 50% marks and 2-year Diploma in Elementary Education (by whatever name known). (1) Degree or Diploma in Electrical Engineering. (1) Degree or Diploma in Civil/Architecture/Public Health Engg. (i) Degree or Diploma in Electrical Engineering. I.SC, Diploma in Dental Mechanic and 2 years working experience. i) graduate in Arts, Science or Commerce from a recognized University or an equivalent degree from an Army establishment. Post-graduate degree in Sociology/Social Work (MSW)/Applied Sociology (MAS). Second Class Graduate with at least six months of training on the use of Computer for Office Automation, Bookkeeping and word processing from a certified Institution or Second Class Graduate with Diploma in Computer recognized by AICTE. B.Sc. with 2 years experience/I.Sc. with 5 years experience in 100 bedded hospital/Government Health Sector/Government Hospital. Class XII from a recognized School Board or an equivalent qualification from an Army Establishment. Class X from a recognized School Board or an equivalent qualification from an Army Establishment. High School with ITI in Electrical/ Mechanical / Generator. Diploma in Electrical /Mechanical/ Biotechnology/Biochemical Engineering. (i) Degree/ Diploma (2 years followed by Internship of six months) in Prosthetics & orthotics from recognized Institutes. Note: Ex-serviceman if available will be preferred. M. Sc. or B.Sc. with four years experience in the relevant area or Diploma with three years experience in the relevant area. (1) M. Mus. or equivalent qualification from a recognized Institution. High School with 03 years Studio Experience. BFA (Applied Arts) or Diploma in Applied Arts or Diploma in Printing Technology and 03 years experience in the relevant area. High School (Science) (Class X) with five years experience in handling sterilization equipment or Intermediate (Science) with three years experience in handling sterilization equipment. (1) ITI in Electrical/Mechanical Trade. B. Sc. with one-year certificate course of Operation Theatre Assistant from a recognized Institution with 5 years experience in OT. Intermediate Science with Diploma in Orthoptics/Optometry from a recognized institution. B.Sc in Biological Sciences, with Diploma in Medical Laboratory Technology (DMLT). (1) High School (10th Class Pass). I.Sc. with 3 years experience in Operation Theater. Intermediate OR Equivalent Examination from Recognized Board. 10+2/Intermediate with Science with 2 years working experience in Operation Theatre of a recognized hospital or one year certificate course of OT Assistant. 1. M.Mus. or equivalent qualification from a recognized Institution. B. Sc. or I. Sc. with 3 years experience or ITI with 2 years experience in the relevant area. Intermediate with Science & ITI (Three years experience in the relevant area). B.Sc Computer Science Or BCA Or B.Sc. with PGDCA. 1. M.Mus or equivalent qualification from a recognized institution. M.Sc.Nursing OR B.Sc Nursing / P.B. B.Sc (N) with 1-year experience. (i) B.Sc. (Hons.) in (Nursing) from a recognised University or Institute OR Regular course in B.Sc. Nursing from a recognised University or Institute. B.Sc/I.Sc with 3 years of experience in relevant area. 10+2 with Science & 2 years Diploma in Dialysis Technician. D.Q. Minimum 3 years experience in relevant field. Intermediate with Science with 2 years working experience in Operation Theater of a recognized hospital or one-year certificate course of OT Assistant. (i) I.Sc. in Biology (2) Certificate in Perfusion Technology D.Q. : One year experience in clinical perfusion CTVS from the reputed institute. Diploma or ITI in Electrical with 3 years’ experience in internal and external electrification of buildings. Diploma in relevant field from recognized Institution with 3 years’ experience in a relevant area. Diploma in the relevant from recognized Institution with 3 years’ experience (ITI with 10 years experience in the relevant field). 1. Degree or Diploma in Bio-Medical Engineering. Graduate with Diploma in Library Science from a Government recognized Institution/B.Lib. Candidates log on to http://www.bhu.ac.in/. BHU Recruitment 2019 - Job notification for JRF Post on a project entitled "Characterization of pseudo-differential operator and wavelet transform on certain distribution spaces" in BHU, Varanasi, Uttar Pradesh on Temporary Basis. Applications are invited by Banaras Hindu University (BHU) on or before 06 Jun 2019 for 1 vacancy. BHU Recruitment 2019 - Job notification for JRF Post on a project entitled " Intrinsically Disordered Proteins (IDPs) under Macromolecular Crowding" in BHU, Varanasi, Uttar Pradesh on Temporary on Co-terminus Basis. Applications are invited by Banaras Hindu University (BHU) on or before 15 May 2019 for 1 vacancy. BHU Recruitment 2019 - Job notification for Project Assistant Post on a project entitled "Establishment of microbial biotechnology application hub at ICAR-NBAIM, Mau" in Department of Mycology and Plant Pathology, BHU, New Delhi on Temporary on Co-terminus Basis. Applications are invited by Banaras Hindu University (BHU) on or before 01 May 2019 for 1 vacancy. BHU Recruitment 2019 - Job notification for Lab Attendant Post on a project entitled ''Role of DCP2 in Drosophila development and tumorigenesis" in Department of Zoology, BHU, Varanasi, Uttar Pradesh. Applications are invited by Banaras Hindu University (BHU) on or before 01 May 2019 for 1 vacancy. BHU Recruitment 2019 - Job notification for Project Fellow Post on a project entitled "Understanding secondary organic aerosol formation, source apportionment and modelling in the Indo-Gangetic Plain" in BHU, Varanasi, Uttar Pradesh. 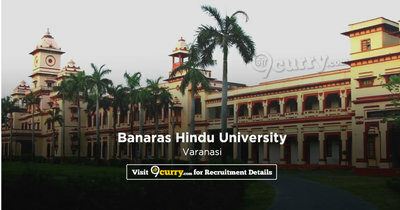 Applications are invited by Banaras Hindu University (BHU) within 21 days of the advertisement for 1 vacancy.